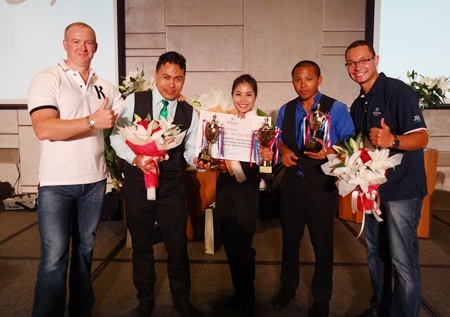 As part of the Hilton SEA F&B Masters 2014/2015, Hilton Pattaya organized their inaugural ‘Bar Cup 2014’, a competition to qualify the creator of a new drink experience for Hilton’s regional competition. All bartenders showcased their talents and skills on stage September 11, at the hotel’s Seaboard ballroom. The hotel gave junior bartenders a chance to develop their confidence, and to prove their ability and knowledge. All 9 participants were required to demonstrate simplicity, authenticity and skills to be amongst the winners. The judging criteria included product knowledge, preparation technique, cocktail presentation, creativity, personal presentation and selling technique. Matthew Wren, Director of Food & Beverage, Hilton Pattaya; Peerasak Rungthatree, 1st runner up from the Edge restaurant; Saichon Chongnok, the winner from Drift bar; Mai Nammaseang, 2nd runner up from Horizon rooftop bar & restaurant; and Jean-Philippe Dehaes, Director of Operations, Hilton Pattaya. Saichon Chongnok from the hotel’s Drift bar was announced as the winner of the Bar Cup 2014, with her amazing cocktail ‘The Character’. She will go on to represent Hilton Pattaya at the Country level where she will compete with other Hilton hotel bartenders in Thailand. Next articleWhat happens if you die in Thailand?